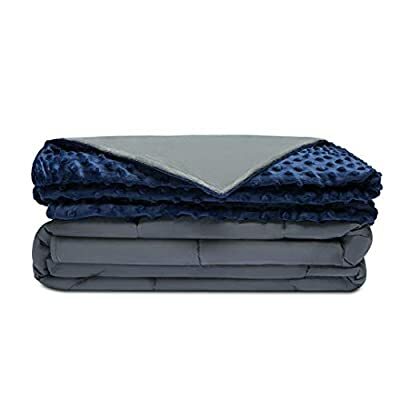 PREMIUM MATERIAL: The Quility weighted blanket is made of 100% cotton material and filled with non-toxic, hypo-allergenic plastic poly pellets. The small square stitching on the blanket keeps pellets from slipping and sliding inside the blanket. SOFT TO TOUCH REMOVABLE COVER: Each compression blanket comes with a removable fleece duvet cover, which is secured into place with 10 buttons along the perimeter of the blanket. Removing the comforter not only keeps you cool during summer, but also makes doing laundry much easier. Just remove the duvet cover, machine wash, and air dry. IMPROVED MOOD & SLEEP: The heavy blanket triggers the release of serotonin and the body's sleep hormone, melatonin. This not only boosts your mood, but help you to fall asleep faster. NATURAL STRESS RELIEVER: The weighted therapy blanket uses Deep Pressure Therapy to combat mild to severe symptoms of anxiety, insomnia, ADHD, Restless Leg Syndrome, and PTSD. The effects of weighted blankets are natural and therefore often used as a supplement to treatment or an alternative to medication. 100% SATISFACTION GUARANTEED: We LOVE our customers and take pride in providing a pleasant shopping experience. If for any reason you're unhappy with your purchase, we offer a full refund- no questions asked!